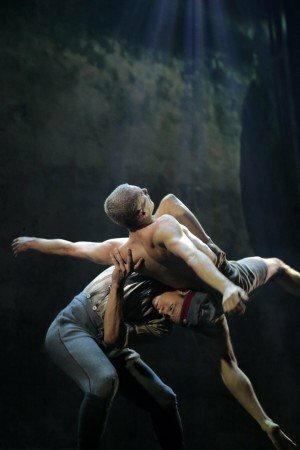 BalletBoyz returned to the Joyce Theater this week with a multi-media presentation titled Young Men. 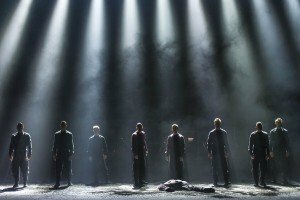 The company’s appearance is cause for celebration – they’re an excellent group of dancers, and Young Men is a heartfelt piece that appears to do what it sets out to do, and generally does it well. 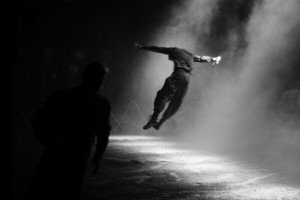 But for all its sincerity and credible atmosphere, it lacks two components that to me are essential to a dance theater performance: a coherent narrative (assuming a narrative of some sort is a component, as it is here), and compelling choreography. 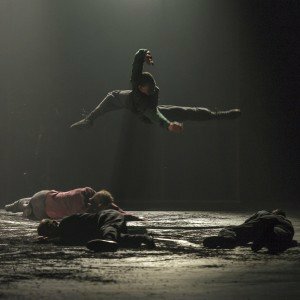 BalletBoyz was co-founded in 2000 by Michael Nunn and William Trevitt (each receiving an OBE designation in 2017) as a vehicle for the two of them following twelve performing years with The Royal Ballet. In 2010, they retired from performing, opened BalletBoyz to new talent, and the resulting all-male (generally) company has since performed to international accolades. It sometimes seems like ancient history, particularly since “history” now crams more information into less time than it used to (think about it) and events seem to recede in memory faster than they used to, but World War I took place only a century ago, from 1914-1918. Also known as The Great War, or The War to End All Wars, the conflict claimed an estimated 16 million deaths (7 million civilians), directly or indirectly led to millions more, and its consequences are still being felt. 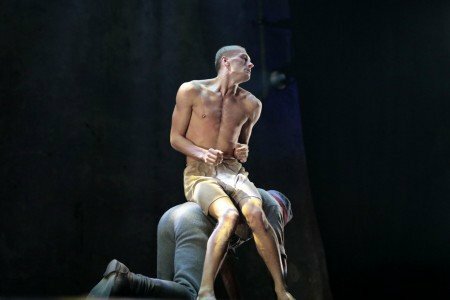 Young Men, which premiered at Sadler’s Wells in 2015, obviously was conceived as a centennial remembrance / memorial to those British soldiers who fought and died in World War I, and those who survived it. This engagement was its New York premiere. Most of the ingredients that together comprise Young Men – specifically the accompanying “background” film, the overall staging, and the lighting – work brilliantly. There is nothing about the film component of Young Men that is less than top drawer. The cinematography (Trevitt is credited as Director of Photography), direction (credited to Nunn), editing (Jimmy Piper), and coloring (George Morrison) create a landscape that is both harrowing and crystalline; the costumes by Katherine Watt appear not only period accurate, but moderated so they quietly enhance rather than dominate the presentation; and the acting by the ensemble (including but not limited to many of those who appeared) was extraordinarily compelling. Expanded, this film accompaniment could have been a stunning standalone film – which apparently was the case. It’s not clear to me whether the film released under the name Young Men in 2016 is identical to the background film for the performance or is a “fleshed out” version, but according to the program notes the independently-released film won several awards. 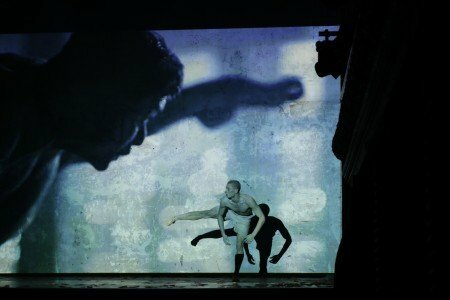 Whether the film that provided the background for, and is integrated with, the live performance at the Joyce is the same as the original or a subsequent version, or the award-winning film, it’s certainly the finest ‘film accompanying a dance theater performance’ that I can recall. 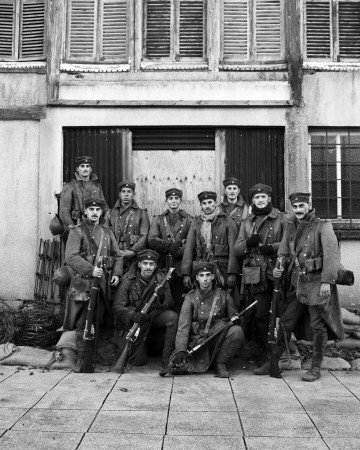 In parts, the film reminded me of battle scenes I vaguely recall from Peter Weir’s memorable 1981 film Gallipoli, except instead of Australian recruits sent to Gallipoli, here British troops are sent to France or Flanders (the film was shot in Normandy). Similarly, the staging, overall, is very well conceived. I suspect that the production has been modified since its Sadler’s Wells premiere to fit the Joyce space, but even with any such modification, the presentation on stage leaps seamlessly from the background film onto and off an almost stage-spanning platform that extends from upstage to mid-stage, and spans almost the entire stage width. 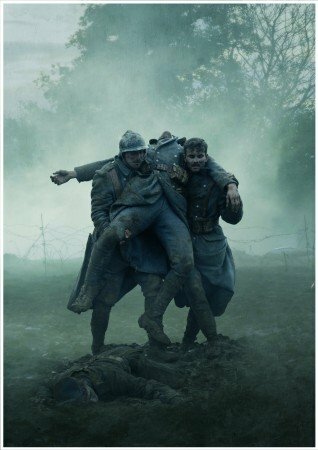 Accordingly, in addition to the usual (but here very well done) live extension and/or mirroring of what’s presented on film, the sense of the soldiers leaping in and out of trenches and being blasted by bombs, from film to stage and back, is vibrant and terrifying. Combined with the spectacular lighting (designed by Andrew Ellis), the film comes to life on stage, and, more significantly, the film’s atmosphere comes to life as well. And although the “fog of war” is by now a cliché, here Ellis creates a living, breathing “fog” that exceeds in quality anything I can recall in a stage presentation. But it’s not just battle. In one of the rare “calm” scenes, the sun-dappled presentation of a bucolic field is translated, again seamlessly, to sun-dappled light that bathes the live individual characters. So why am I not jumping for joy at a marvelous commemorative presentation? While the production can be seen as an anti-war piece, to me it’s more about the suffering that the combatants, and to some extent civilians, endured during World War I. Young Men doesn’t condemn war per se – there’s no connection to war in general or war as it arguably has evolved into a battle of technologies where, at least theoretically, combat may no longer be at arm’s length. More significantly, there’s no villain to this piece. War – this particular war – is an event that combatants and those who love them lived through and endured. It just is. There’s no blame, no sense of the senselessness of it all. This is not The Green Table. For example, the “drill sergeant” who is abusive during the recruits’ training early in the presentation (very well presented, on film and on stage) and seemingly hates himself for the brutality he shows – is he the same soldier who seems to lose his mind as the piece progresses, and drowns in a muddy puddle / lake? And there’s a recurrent theme of sorts – early on, a soldier receives what may be a “Dear John” letter, which causes him to jump out of the trenches and attempt suicide-by-combat, only to be rescued by another soldier who risks life and limb to save him. Later, a young woman, dressed like a nurse, somehow meets a soldier in a clearing near the battle zone, partially disrobes apparently intending to change into a soldier’s outfit, but is found by one wandering soldier and they immediately begin to act like this was a planned rendezvous. But why the costume and the partial costume change? What was really happening? Then, while the woman and the soldier are joyously writhing, other soldiers – led by one particularly virulent man – pull them apart and eventually one drags the woman off-stage (presumably to be assaulted). Are the virulent man and the man in the romantic scene with the young woman the same as, respectively, the one who gets the Dear John letter and the one who saves him? And is the one who gets the Dear John letter the same as the drill sergeant? And in the film’s most harrowing scene, with one soldier effectively drowning the other, are those two the same two soldiers? And what was this “fight” about, since it happened so much later than the confrontation with the young woman and her maybe or maybe not boyfriend soldier? And was the “drowning” “real” or imagined. And who’s the woman who brings the soldiers eggs? Where does she come from, and where does she go? And what is it about her being considerate to the soldiers that prompts the “crazed” soldier (maybe drill sergeant, maybe virulent recipient of that Dear John letter) to go off the deep end, again. And why are the costumes worn by the soldiers in “Act II” different from those in “Act I”? Is Act II no longer about World War I, but World War II also? If the costume change was intended somehow to universalize the suffering of war combatants, however, more would have been needed than a simple costume change. These are just some examples. It’s possible that there’s a connection between these characters that I couldn’t follow, and it’s also possible that there’s no connection, and the characters and events are emblematic of “things that happen” during war regardless of who the specific character is. But some clarity would have been helpful. A greater problem, overall, is that these soldiers’ are depicted as fighting two fronts: certainly the invisible “other side” that sets off bombs and uses poison gas, but also, much more directly and vividly, their fellow soldiers crazed by war. Even in the filmed “drowning-murder” scene, the two soldiers seem at once to be fighting each other and loving and trying to save each other – so much so that you don’t really know whether the drowning was real or imagined, or an unintended consequence of a soldier’s losing his mind (maybe, or maybe not, parallel to the “attempted suicide by combat and rescue” scene earlier in the piece). Even if all the above made coherent sense and I just missed it, there’s the choreography (by Iván Pérez). With some wonderful exceptions – the duet between the young woman and the soldier and the depiction of the soldiers battling to tear them apart; the compassionate “rescue” of a shell-shocked young soldier (including a stunning scene of the rescuing soldier providing his own body upon which the emotionally destroyed soldier could rest); the ultimate pas de trois / pietà at the end, with a (presumably) mother and girl-friend comforting a returning soldier suffering from PTSD – it’s all jumping and running and pushing and pulling and leaping onto and down from and onto and down from the platform again, and hitting the ground and getting up and hitting the ground again and getting up again, sometimes in synchronized groupings sometimes not, and through it all seemingly to fight each other … all the time. It gets tedious to watch. And the score (by Keaton Henson), except for those few periods of calm, is all tension all the time. Everything’s at the same decibel level, and it feels endlessly repetitious. This is understandable as a reflection of seemingly near-constant battle and stress, but the theater isn’t a battleground. The brief periods of calm are welcome, but they’re too rare, and too often only lead to more acts of violence. The nine dancers who appear live – Joey Barton, Benjamin Knapper, Elizabeth McGorian (a Principal Character Artist with The Royal Ballet who played the “older woman” / mother of one of the soldiers), Harry Price, Matthew Rees, Liam Riddick, Matthew Sandiford, Bradley Waller, and Jennifer White (the “young woman”) – and the thirteen who appeared in the film (including six of those who appeared live) executed sensationally. Ultimately, however, although Young Men is undeniably a work of performance art worthy of admiration and respect, its value is limited by its scope and concept. It’s a well-deserved memorial to those almost forgotten soldiers who fought and suffered in World War I, but it pains me to believe that it might have been better than it is.